Hey Sam, I’m good thanks. It took me about another week to get over the boot camp… but I’m charged up ready for the Xmas onslaught now! Hope week 2 was as much fun as week 1 was !? So the questions. To me surf coaching is about helping me to get more enjoyment out of the time I get to spend in the water. I don’t get to surf all that often so what I want is to figure out how to catch more waves and feel like I’m surfing them better each time. Coaching for a sport in which I will never compete feels a bit odd, almost decadent but it makes perfect sense. Surfing is one of the only sports I do purely for fun. It’s a big treat for me so why not enjoy that treat as much as possible! What did I expect from the week? Not sure really. But I guessed it would involve someone sitting on a beach looking at us surfing and getting pointers at the end of each day. How did it go, from a coaching point of view? Honestly, I was delighted at what I got from the week! From day one I got very simple, very practical things to do to help me to improve from my level. There wasn’t any fancy technical explanations. Just easy to understand advice such as ‘decide which way you are going to go on the wave, take 4 extra hard paddles, push down with your chest, push more on your inside rail, then pop up and your fins and rail will be engaged’. Then watching the video replays in the evenings I was able to see what I need to change and visualise it for the next day. At the end of the week I had a list of about 5 practical things I can work on each time I go surfing that I know will get me to the next level. That is something I never had before. It’s got me excited about surfing again ! You manage to channel your passion for the sport into massive energy during each session which really rubs off ! I’ve never had a swim coach get into the water and spend hours coaching / motivating during a session in my 10 years doing triathlon ! From a set up point of view? I actually felt completely spoiled having a chef, driver, photographer, videographer and pro surf coach each day! Having a choice of Firewire boards to take out, a plan for dinner each evening and a central location in town was great. There was a nice balance during the week, it was a lot of time in the water but it was never too serious and a lot of fun. Tucking into several creamy rounds of Guinness and talking shite after a great day surfing ! I could have been in the West of Ireland. Day 2 at Porto de Mos. Spotted a lovely left that was working and had it to myself for the afternoon. On the last day taking out a board with 10 liters less volume than I would normally ride and feeling the difference when I put the tips I got all week into practice, and paddling back out to the line up with a massive grin. I thought the area was pretty good. Loads of variety and lots of different spots for different wind and swell conditions without too much time spent checking. And warm water compared to here! I’ll definitely be back to Lagos with my mates.. I don’t like giving feedback without some helpful suggestion for improvement but there is very little I think you could do better. The only small thing is to maybe send each person the iAM BANDS level surf chart and a short questionnaire to see where they think they are and what they think they could improve on before the week starts. It would be interesting to compare to the end of the week. I heard from the Tobys that they are planning another set of boot camps next year? If they are I’ll be there with my twin for more adventures ! Hope you are doing well, got home OK and everything. I just wanted to write you a message to say thank you. It was lovely hanging out, good yoda chats! I don’t feel like I’ve ever had such a big leap forward with surfing as well – so really, thank you for everything. What did I expect/how did it go? I wasn’t sure what to expect from the boot camp weeks at the surf experience – I’ve not had surf lessons since I started surfing a few years ago. Most of the people I normally surf with are a lot better than me, and they give me well-meaning tips or advice – the standard ‘rotate your shoulders more’ or ‘try and compress more’. The thing is, of course, when I’m actually on the wave its pretty hard to put these directions in to practice – generally I’m just so excited that, unless it’s a long point break wave, I don’t have time to think! From the first surf with Sam he started slipping in little tips that I could immediately put in to practice – he really gave me practical instructions that stuck in my brain. I felt like every day I had a bit of a breakthrough, and it all just left me so amped to get back in the water the next day. General hangouts and chats, Rach’s delicious food and some pumping days at Porto de Mos! Also big Thankyou to Steffan for taking pictures… I know how hard it is to be on the beach working when the waves are amazing! I had a thought, I don’t know if you already did this with the actual people (we used to do it with sailing as a self improvement and evaluation) – what about giving everyone a form to fill in with rating themselves out of 10 on various stuff in various conditions, and then getting them to do it again at the end of their trip (they can do it by themselves) so they can think about how the week has helped them. And then maybe setting some goals (like more comfortable with deeper take offs, or…comfortable in bigger waves.. or understanding forecasting more, or whatever), and then going through with them some techniques to achieve those goals (probably one of the techniques to achieve their goals is gonna be to do another bootcamp or go to your academy! hehe). It could be a good way to get people to keep coming back and to start thinking about continuously and consciously improving their surfing. You probably already do it anyway, but it’s just a thought! I just wanted to drop you a quick message to say thanks so much for taking the time to help me with my surfing while you were here. Not being part of the bootcamp, as such, I was so stoked that you were happy to take the time to analyze my surfing and break it down in such a way that even I could understand! Just back from a road tip to Sines where I managed to get into at least 90% of the waves ( on my new board! ), angled the board, occasionally looked up and even did a cheeky turn here and there. Yeowwwwww amazing and all down to top coaching! Had the most amazing time your coaching was inspiring can’t wait to get back in the water. If I don’t see you before I’ll be down in the spring for some more coaching and go for my Blue band, might try and drag all the boys down for a jolly boys outing. Can’t thank you enough…thanks for the feedback on my surfing. 1. (What is surf coaching?) -Surf coaching is simply the best way to improve your surfing. Hola! Here are the answers for Sam! Sorry the bad English, ( *Nina is from Sweden -) hope you get it. For me coaching is the same no matter what kind of sport you practice. I, as a handball coach for girls age 11 try to encourage and support via positive response. I want a coach to see my progress and what I do good. And encourage that. But of course also point out where I need to progress and do better. What I liked with you Sam is that you weren’t so theoretical, instead you in many ways made it so be much more simpler compared with the surf coaching I have had before. And you showing us practical how to work with our turns. Or how to just by looking can control my maneuvers. What did you expect this week? I was of course hoping that I would make a progress with my surfing. I was also hoping to get a confirmation on my own perception on what level I am as a surfer. I was also expecting to get help on how I can improve myself. I also thought I were to end up in a group of guys in their twenties, ripping with epic turn and drinking broccoli juice as after surf drink! I was also worried over being the only woman in the group. And nervous about if I would be good enough to take part. And the three guys in the group turned out to be so lovely team members. Closer to me in age and drinking beer as after surf drink. I wasn’t prepared for all the aching and sore muscles. OMG, what pain! It is also intresting that Sam pinned down my biggest issue when it comes to surfing and that is my own mind and my fear to commit for the best waves; the ones that I too many times are thinking: -Too big. The 6 ft(?) wave I surfed at Porto de Mos. In the video and photo material I now can see that if I had been a bit more experienced I would have been surfing a tube. And this made me think or I actually now believe that it would be possible for me to surf a tube one day. We should have had more time for the evaluation of every day. Absolutely not to cut down in the hours or time in the water. I LOVED that we left at around 8.30-9 every day and came back late in the dark. As much time at the beach as possible! But maybe we should have had a set time in the morning 7.30-8.30 with some photos and film ready to show from the day before so everyone got an update. Or a set time around lunch were everyone sat down for a proper talk. And I think I have had been more relaxed with a girl or two in the group. Loved it! Even though tears and anger all the joy and laughs are the memory. Can I please do it again? The more I think about this wave I surfed, I realize that it has changed my personal goal regarding my surfing. I started surfing at 40 years of age and I have all the time been thinking that I will never be really good in surfing. My personal goal has been to be able to catch waves, ride them and have fun. The ultimate goal has been to one day maybe be able to walk on the board while longboarding, maybe even get a noseride. 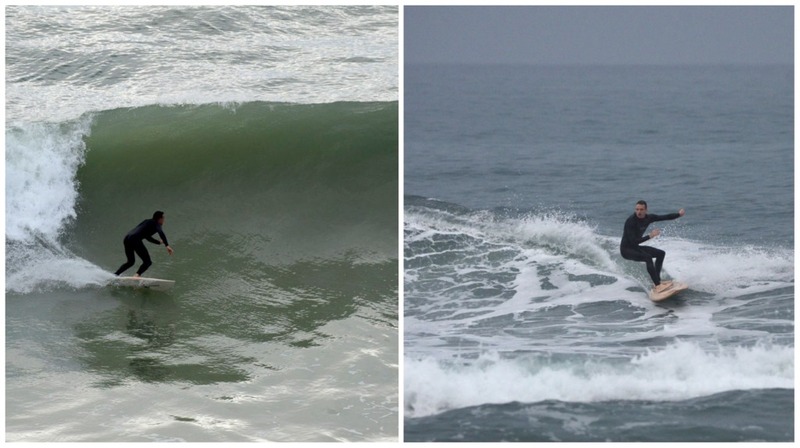 I haven’t until after this week realized that me surfing a tube actually can happen. Something I earlier has thought of as impossible is now actually in reach. So the bootcamp has changed my perception of my limits, It has shown me that I can challenge myself to go even further than earlier expected.